Fifty-four years is long enough. 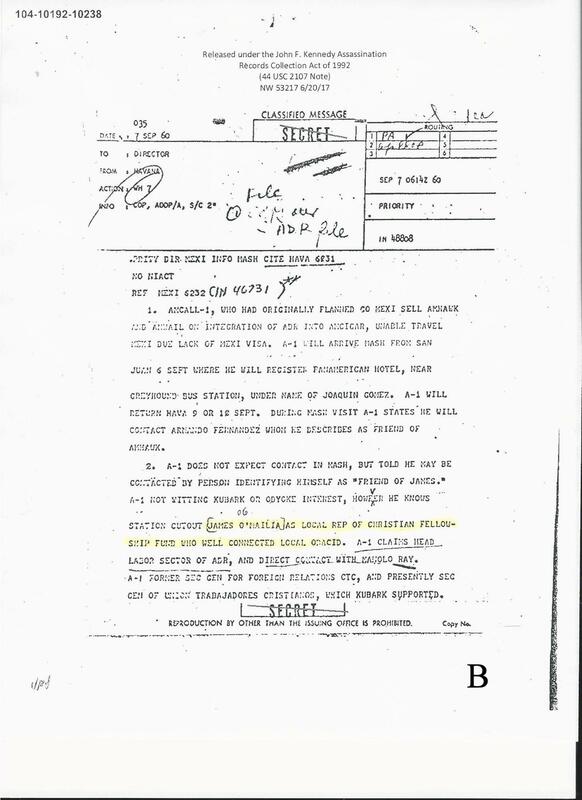 The potential for discovery represented by the recent and upcoming release of remaining government files on the Kennedy assassination was realized this week with the startling revelation that beginning in 1956, Earle Cabell, brother of Deputy Director of Central Intelligence Charles P. Cabell and Mayor of Dallas at the time JFK was assassinated, was a CIA asset. We are now able to review his 10/17/56 CIA Secrecy Agreement, his CIA 201 file cover sheet, his 5/13/57 CIA Personality 201 File Request, and a cover sheet indicating that the House Select Committee on Assassinations (HSCA) reviewed his 201 file. The National Archives and Records Administration (NARA) master listing of files scheduled for release indicates that the Assassination Records Review Board (ARRB) classified these records as “Not Believed Relevant” (NBR). ARRB Director Judge John Tunheim, speaking at the National Press Club during a CAPA sponsored event this past March, said that he now believes that many of the NBR-designated documents are indeed relevant. With the benefit of hindsight, that may have been an understatement. The official ARRB classification “assassination-related” was not limited to issues or evidence pertaining exclusively to the scene of the crime. Dr. John Newman argues that real progress in solving the JFK assassination will not come to those who await a smoking-gun revelation, but will be possible if we first have an understanding of the internal language of US government cryptonyms and pseudonyms. Only by establishing the true identities of the actors — and their locations and activities — can we hope to separate fact from fiction in this mystifying saga. That has been his goal in a series of publications on America’s untold history over the last three decades. As a retired strategic intelligence cryptologic analyst for US Army Intelligence and the former military assistant to the director of the National Security Agency, Newman has some unique qualifications. His works on the cold war and America’s involvement in Vietnam have been recognized by many, including Arthur Schlesinger, Jr. and former CIA Director William Colby to be among the most authoritative and significant yet published. In past publications he correctly foretold what we are now seeing in the 2017 release of JFK records. His 1991 book, JFK and Vietnam, documents Kennedy’s navigation of a dangerous course through cold war hot spots and a very divided administration. What eventually emerged is an astonishingly dishonorable deception: a deliberate attempt to manipulate the President of the United States into authorizing a war policy to which he was fundamentally opposed. The media firestorm created by that thesis, that JFK was committed to withdrawing from Vietnam at the time of his death, and obstructions such as the book’s suppression by Warner Books after only five months on the bookshelves, did little to dissuade Newman from pursuing the story wherever it might lead. 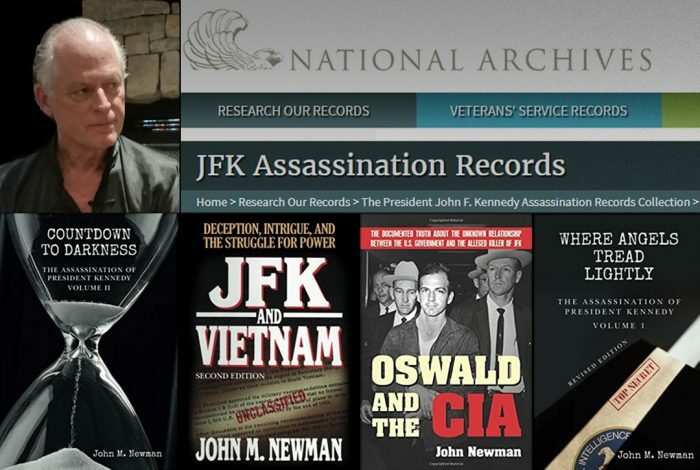 Newman re-entered the JFK case in 2015 with the publication of Where Angels Tread Lightly: The Assassination of President Kennedy, Volume One. The updated and expanded second edition of JFK and Vietnam appeared in January 2017, as did Volume Two in Newman’s series on the assassination, Countdown to Darkness. The CIA was not the only federal agency to involve itself with organizing, recruiting and utilising anti-Castro paramilitary groups, but it may have been the one that invested the most time and money. JFK assassination research has focused a great deal of attention on the Agency’s handling and control of such groups and the activists who made up their memberships. The CIA officers, agents and assets who ran those operations are also worthy of our attention. Volume II offered bold new predictions about the pseudonyms and cryptonyms used for the CIA officers and contract agents who dared — without diplomatic protection — to run the stay-behind nets inside Cuba after the January 1961 break in relations with the US. Three men whose careers would become increasingly important to our understanding of operations being directed against Castro by the CIA are Emilio Americo Rodriguez, Tony Sforza, and James Joseph O’Mailia. Countdown to Darkness also revealed that the pseudonym (for use in CIA reports and files) “Peter J. DiGerveno” belonged to Rodriguez while he was assigned to the CIA’s JMWAVE station in Miami. Sforza was the person behind the CIA cryptonym AMRYE-1, and was assigned the pseudonym “Henry J. Sloman” for his stay-behind work in Cuba and for use in his assignment at the JMWAVE station. Into the Storm (Volume III, due out in December 2018) will reveal that both Rodriguez and Sforza worked closely with an American CIA contract agent in Havana, James Joseph O’Mailia, whose cover was as a professor of English at the University of Villanueva. By early 1960, O’Mailia had become the Agency’s principal go-between and cut-out to the Christian Democratic Movement (MDC) group and others being groomed to sabotage the Cuban economy and overthrow Castro. During his research for Volume III, Newman discovered that O’Mailia was the person behind the CIA cryptonym AMCRACKLE-1, and that CIA documents used the pseudonym “Gordon M. Biniaris” for his work with the anti-Castro groups in Cuba. O’Mailia’s profile in Havana matched that of a man using the name “Joe Melton.” Melton, according to Antonio Veciana — a militant leader of the paramilitary exile group, Alpha 66, who was involved in terrorist acts and attempts to assassinate Castro — was the American who trained him in sabotage and psychological warfare operations. 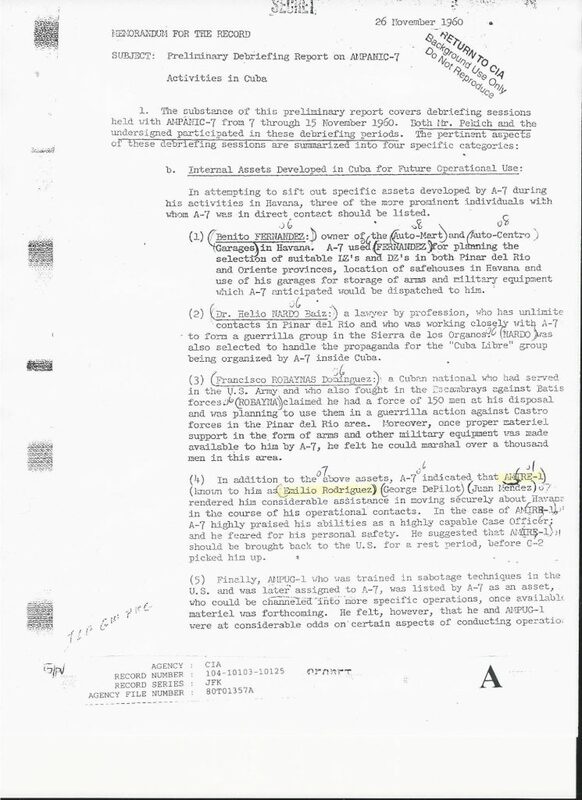 Veciana alleges that CIA propaganda expert David Phillips — using the name “Maurice Bishop” — was present for several of the training sessions. Moreover, Veciana has claimed that he met with Oswald and Phillips in a Dallas office building in September 1963 — shortly before Oswald went to Mexico City seeking a Cuban visa. Earlier this year the publication of Antonio Veciana’s memoir, Trained to Kill, was received very positively by some reviewers; for others, it has raised more questions than it answers. Familiarity with figures such as Rodriguez, Sforza and O’Mailia is required if we are to effectively evaluate claims that are presented as facts. NARA released several records with Rodriguez’s AMIRE-1 cryptonym in the clear and the diagram for “Eugenio’s” stay-behind net in Cuba. 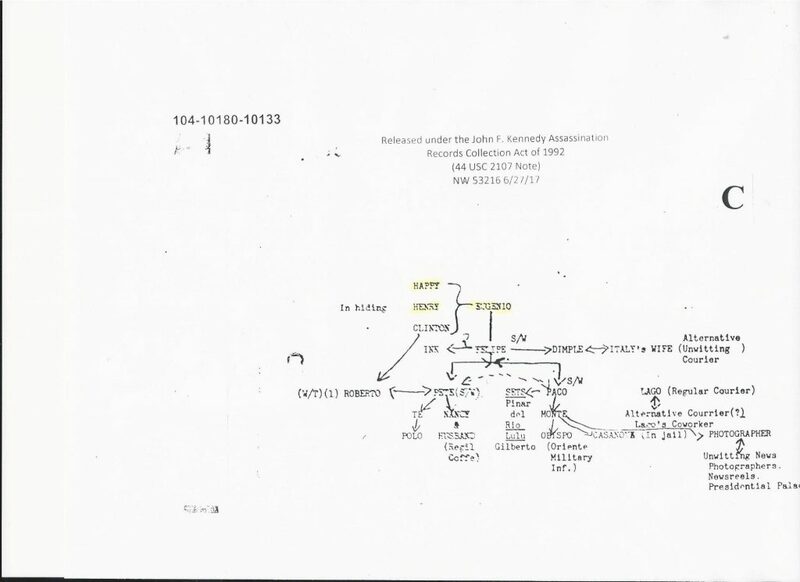 On his net diagram were the names “Henry,” for “Henry Sloman” (Tony Sforza), and “Happy,” who may have been James O’Mailia. With NARA’s July 2017 release of JFK records, we now have the opportunity to check the predictions and assessments set forth in Countdown to Darkness. Many of the estimates in Newman’s Volumes II and III have been confirmed by the recently released files. We are getting dozens of crypts, pseudos, country digraphs, and operational codenames. In many instances their presence alongside of the already released documents permits many more new discoveries. An overall assessment will have to wait until everything has been released. All three CIA operatives in Cuba were fortunate to escape from the island. Rodriguez and O’Mailia were arrested and imprisoned by Castro’s secret police. Sforza went underground until his escape by boat in mid-July 1961. Rodriguez, who had been arrested and held for six days before the invasion, was permitted to leave on an airplane to New Orleans at the time Sforza fled the island. O’Mailia, who was arrested during the exile invasion, was held in prison for three months and then he, too, was permitted to leave in mid-July. If Cuban authorities had realized the prominent roles these three figures would play in the CIA’s anti-Casto campaigns, they would certainly not ever have been allowed to leave Cuba alive. Newman’s work not only resolves the multiple identities of the key CIA officers and agents who risked their lives in this Cuban-American drama, but also recounts the circumstances in which their flight from Cuba took place in the context of the disastrous Bay of Pigs. The claims, by top advisors to Presidents Eisenhower and Kennedy, that an exile invasion would trigger an uprising of the Cuban population against Castro were known to be false by those who made them. In Volume II, Newman makes a persuasive case that the exile invasion was designed to fail in order to pave the way for a full-scale US invasion of the island. Castro’s victory on the beachhead in 1961 was blamed on the failure of the Kennedy administration to provide sufficient air support for the invaders. Along with the diplomatic resolution to the Cuban missile crisis in 1962, these purported “betrayals” of those who died or were captured at Bahía de Cochinos would, in turn, form the context and a possible motive for the murder of the president. So, here we are in 2017, the year that we are promised will solve some mysteries, answer some questions, and perhaps settle the case once and for all. Or not. We can be confident that some details of the JFK assassination story will no longer be hidden from us. Revelations such as those cited in this article provide valuable new pieces to our collective understanding; they allow us to measure our progress by improving upon previous assessments, and they assist us in getting closer to our ultimate objective: to put the puzzle together. A final note of caution: Documents don’t always mean what they say or say what they mean. What they purport to reveal is seldom complete and may not be accurate, perhaps even false, especially when they are issued by intelligence agencies whose tradecraft includes deception and maintenance of “plausible deniability.” In cases where something that should be there is missing — such as the disappearance of Volume 5 of Oswald’s Security files — the significance of what is absent, what Professor Peter Dale Scott refers to as the negative template, is also informative. Thanks to Malcolm Blunt, Bill Simpich, Dan Hardway, Peter Dale Scott, and Jerry Shinley for their contributions to this article. Special thanks to Milicent Cranor, Jimmy Falls, Klaus Marre, and Russ Baker for their invaluable assistance. Alan Dale serves the noted FOIA attorney, Jim Lesar, as Director of the Assassination Archives and Research Center, aarclibrary.org, and is the host of JFK Conversations, jfkconversations.com. He is affiliated with the research groups JFK Lancer and CAPA, and is responsible for administration and content at https://jfkjmn.com. Postponement beyond the Oct. 26, 2017 deadline set 25 years ago by the JFK Assassination Records Act is possible if the president certifies that it is necessary to prevent an identifiable harm to military, defense, intelligence, law enforcement or foreign relations and that harm outweighs the public interest in disclosure. Related front page panorama photo credit: Adapted by WhoWhatWhy from file cabinets (MedillNSZ / Flickr – CC BY 2.0) and JFK limousine (Walt Cisco, Dallas Morning News / Wikimedia).